Lindsey Paretti’s debut film Blood Island has been nominated for two Wildscreen Panda Awards: Emerging Talent and Shorts. This 12-minute film tells the story of chimpanzees in Liberia which were infected with hepatitis and underwent testing in order to ‘unlock the mysteries of human diseases’. The experiments lasted for three decades before ending in 2007, however the remaining chimps – raised in captivity and still infected – were transported to remote islands in the West African country. 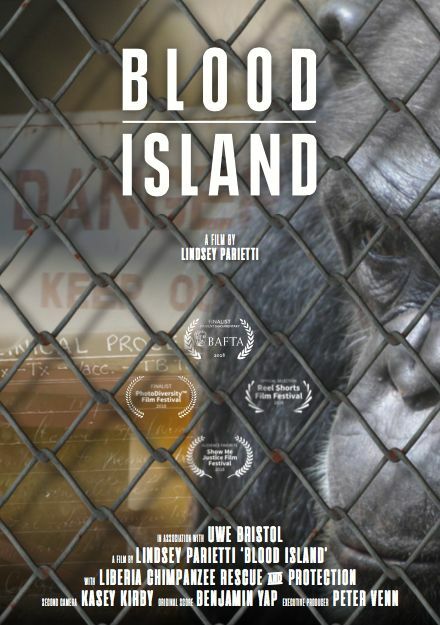 Blood Island tells the powerful story of the chimpanzees, their captors and the people still fighting to save them. Lindsey is a fellow supporter of Liberia Chimpanzee Rescue & Protection whom our on the day raffle will be supporting. As a journalist & BAFTA winning film maker, Lindsey is of course inundated with work, she is hoping to attend #TEAMEARTH, but I am afraid you will only find out nearer the day if she makes it !! The film though will still be shown & I there will be a stand promoting the work of Liberia Chimpanzee Rescue & Rehabilitation.